Elissa and Kristina explore the two related themes of this final Sunday before Great Lent: the theme of Adam and Eve’s expulsion from Paradise, and the theme of forgiveness. Kristina and Elissa explore Christ’s words about the Last Judgement, and what they mean for us as we live our lives today. 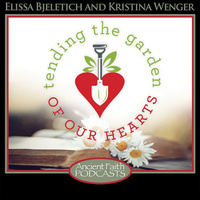 Elissa and Kristina explore what we know about the Holy Archangels. How many can you name? Kristina Wenger and Elissa Bjeletich share some favorite Scripture verses and quotes to help us shake off our wintry blues.